Aliki Panagopoulou PhD, member of ARCHELON and conservation scientist in the Leatherback Trust, USA, after several failed attempts was lucky to witness this amazing phenomenon of nature this year in Ostional Nature Reserve. She has kindly sent her pictures for us to get a taste. The pictures were taken in the beginning of the arribada; That is why all turtles shown are heading up the beach. There are only two species of sea turtles in the world that synchronize their nesting en masse, but not on the same beaches – Olive Ridley (Lepidochelys olivacea) and the endangered Kemp’s Ridley (Lepidochelys kempii). This synchronization is a still a mystery to science. Turtles nest at Ostional year round, but peak time is during rainy season. From August through December arribadas occur regularly once, sometimes even twice a month, and the numbers of nesting females are in the range of hundreds of thousands as opposed to tens of thousands for the dry season months. Usually the arribadas occur during the darkest nights: a few days before the new moon, when the majority of turtles arrives between 8 pm and 4 am. The largest "arribada" thus far recorded in Ostional, took place in November 1995 when a calculated 500 000 females came ashore. Amazingly, Ostional is the only beach in the world where harvesting turtle eggs is legal. 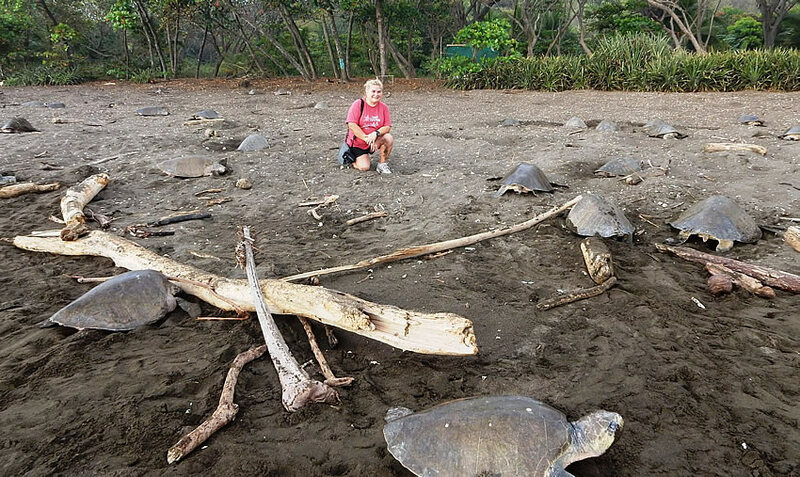 Scientists found out that most of the eggs deposed in the first nights of an arribada are destroyed by other turtles coming later to dig their nests. Therefore, since 1987, the government of Costa Rica allows the community of Ostional to harvest the doomed eggs on the first three days of an arribada. In return, the villagers protect the turtles, clean debris from the beaches and patrol day and night for poachers. (from https://nicoyapeninsula.com/ostional/) .